ReCentered Church : Where's My Hardware Store? A few weeks back my six year old son hung on the coat hooks next to the front door in our vestibule. He pulled the entire rack out of the wall. I told him he had help fix it and pay for the materials necessary to do the job, which amounted to a small container of joint compound to fill in the holes where the moly-bolts were. He got his allowance money and we drove to downtown Springfield to buy our supplies at our local hardware store. We parked our car in the back of the store and went to the door and saw that is was locked. We looked in the windows and all the stock was gone, and got in the car and drove to the massive Home Depot in Vauxhall. I know this is not the first hardware store to close in recent years, but this affected me deeply because something I relied on to be there was now gone. I like going to the small store and knowing the proprietor. The people in Home Depot are usually pleasant and I do not usually have any complaints with the service or products, yet the anonymity and the scale are intimidating when all I need is something small to do a quick job. 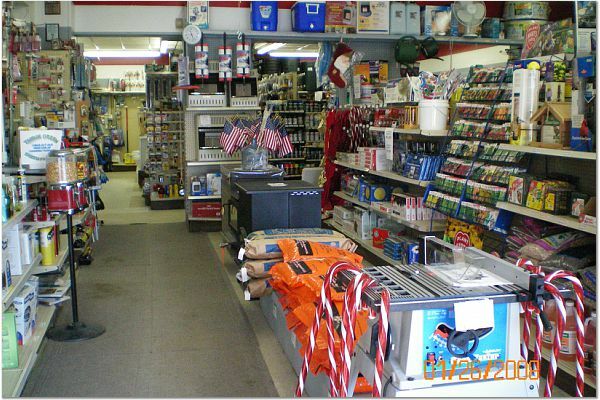 The economy these days has made the small scale hardware store a thing of the past, unless a store has niche it is doomed. I began to obsess "is our congregation like that hardware store?" Have the economies of scale and the expectations of people in our our area that the church will provide high quality program with minimal commitment conspired to doom the midsize congregation to oblivion. Statistics seem to be leading in this direction. Large congregations are chugging along, many small congregations do wonderful ministry by using their intimacy as a strength. The midsize church seems to be most at risk. The small congregation seems to be analogous to the home based business and the large to the big box store or prominent franchise. Where does that leave the rest of us. The hope that I cling to is that the community I serve is not a store, but as Eugene Peterson writes a “community of sinners gathered week after week… the Holy Spirit gathers them and does his work in them." (Working the Angles p.2) Our task is not to be a purveyor of goods, services, or an experience, but to simply bring people together with God. Dietrich Bonhoeffer shakes us out of our stupor and fear with these explosive words, which open his masterpiece The Cost of Discipleship: “Cheap grace is the deadly enemy of our church. We are fighting today for costly grace. Cheap grace means grace sold on the market like cheapjack’s wears.” If we are to be Biblically faithful (rather than market driven successful) we need to call people into a relationship with God and their fellow sinners to join in this movement, which is dedicated to following our savior Jesus Christ. This means we understand that we are part of a wider family than our congregation and hopefully realizing that we are not in competition with the other expressions of Christianity in our vicinity. Yet we still need to recognize that how the people of our communities engage the world matters. In a recent Alban Institute post, Peter Coutts blogs here “We live in a fully democratized, consumer-oriented society in which people believe they have the autonomous power to make choices, including within the realm of religious belief, practice, and participation.” So we have to use the tools of Law and Gospel to reveal the truth of God’s Word to the people we serve. The law is that every human choice whether to shop at the hardware store or home depot, or to go to the mid-size church in town or mega-church by the highway is bound by our innate sinfulness. The grace of God reveals that God makes himself available to be freely chosen. As Christian leaders we are called to help people make the right choice, the choice of Jesus, the choice of life. Hopefully if we really do it right, those who walk with Jesus will realize it really was not a choice at all. The way for us who have more limits on our people and resources to begin to live out this calling is to help the communities we serve find their niche or place. This usually means leading people to prayerfully discern where their gifts lie, communities can then specialize according to the gifts of the Holy Spirit given to them. One community will allow people to see the grace of God through excellent and passionate traditional music, another will demonstrate it by serving the poor, another through good preaching, another through education, still another through support groups for people in critical phases of life, and even some that just provide a well rounded spiritual home. So yes my hardware store is gone, but our church still lives, breathes and moves to bring God’s love to our world.